Delicious breakfast muffins made with Weetabix and wholemeal flour and flavoured with blueberries and lemon. 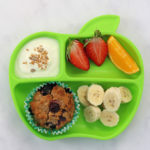 Perfect for an instant breakfast for kids and adults too! Preheat the oven to 180c fan and line a muffin tin with 9 paper or silicone cases. Add the weetabix to a large mixing bowl and crush with your hands. Add the flour and baking powder and mix well. Add the coconut oil to a large jug and melt in the microwave. If it’s very hot allow to cool a bit before adding in the egg, milk and honey. Mix well. Add the wet ingredients to the dry ingredients and then add in the blueberries and lemon zest. Divide the mixture between the muffin cases and bake in the oven for 20-25 minutes until browned on top and cooked through. These muffins will keep in the fridge for up to 3 days. They can also be frozen and defrosted overnight in the fridge.